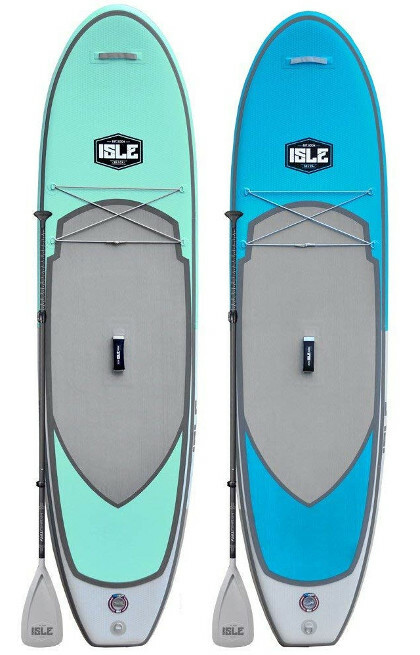 Since 2004, ISLE Surf and SUP has started to make one of the largest selections of trusted inflatable stand up paddle boards offering nothing but premier quality for riders of all sizes and interests. You will find whatever specification you’re looking for in a board thanks to the various designs and sizes provided by the ISLE Surf and SUP. The fact that stand up paddle boarding is one of the fastest-growing water sports makes it quite a challenge for any brand or company to always create what will conveniently and flexibly serve the costumers. Standup paddle boarding combines the best of both worlds; sport and leisure. 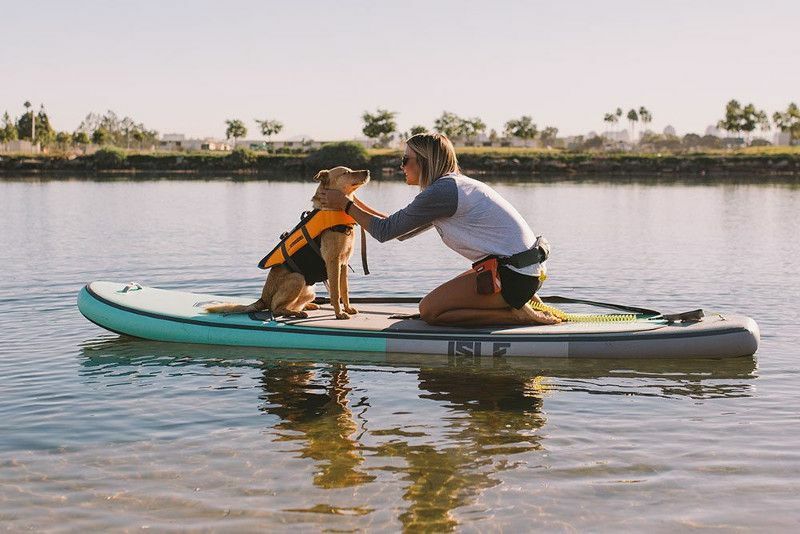 Owning an inflatable paddle board means that you’ll be getting a full body workout while exploring the nature around you in the best recreational way possible. The ISLE Airtech All-around is a living example for what iSUPs are capable of; with a sleek design and a strong body, this board is what a lot of you are looking for. Keep reading to figure out more. 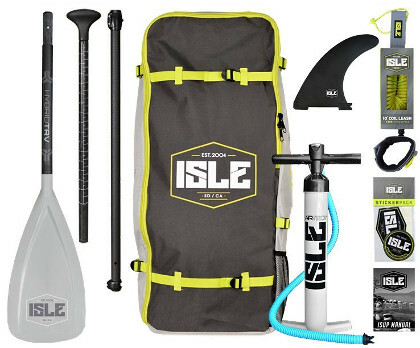 The ISLE Airtech is an all-around iSUP that is meant for flat water as it’ll also do just great in small waves. It is 10.6 feet long, 31 inches wide and 6 inches thick. Now let’s talk dimensions. A 10 feet long board is never a bad choice; it’s neither too small nor huge; it’s just as it should be for all riders around 6 feet tall or less. It feels really light carried with one hand once fully inflated, as it’s easy to pack once deflated. Just to keep you informed, in case you’re thinking about a bigger board by the ISLE Surf, you might consider the the Airtech Touring SUP (12.6 feet); it’s quite the upgrade anyone would go for once you master the sport. As for width, 31 inches is the best deal a 10.6 feet board can get. It provides you with enough space to stand comfortably, to sit or even lie on back. The same thing goes for thickness; those 6 inches will do a terrific job keeping you away from the water. It’ll be highly challenging to make the board bend after you inflate it; it’s thick and rigid with minimum flex. This is my favorite thing about the ISLE Surf; they never compromise the quality of their inflatable boards. Each iSUP of theirs is constructed using the Airtech Fusion Lite technology which coats the drop stitch with a special seal and bonding layer, and then fuses a machine-laminated, higher-density military grade PVC layer. This process removes any human factor or errors in the bonding and creates a consistent, unique bond that’s just not achievable via traditional hand-gluing resulting in a board that’s both durable and lightweight. A board like this will definitely take a beating for years if you ask me, however, my advice is to always be friendly while unpacking/packing the board and while paddling; this way, you’re guaranteed to expand your board’s life. Traction pad that covers half the board’s back; it’s thick and soft with a real grip that’ll keep you balanced on the board. It also looks really good if you ask me. A set of 4 D-rings on the board’s front which might be a little small compared to other boards with more D-rings, providing you with more space to secure your cargo. A 5th D-ring is on the board’s tail for safety leash attachment. 2 carry handles are also featured; one of which is central while the other in near the board’s nose. You can easily carry the inflated board using the central handle, while the other will allow someone to help you carry it. The navigation system consists of 3 fins; one is large, removable and central, while the other two are smaller and fixed. Those fins are really something; the board delivers great tracking in flat water thanks to them. A 3 piece aluminum adjustable paddle. A high pressure hand pump and gauge. Purchasing an inflatable board, I’ll assume that you’re aware that those boards are not meant to be fast. The speed aspect on this one is decent I’d say, though it could be better with a longer board. However, it’s steady, rigid, and responsive. I did not have a hard time changing directions or keeping a straight line while paddling in flat water, but a beginner might need some time to get a full grasp of the matter which is only normal. Inflatable stand up paddle boards are meant to make water activities an accessible fun thing for everyone with the highest utility and practicality levels possible; thus, I definitely won’t go big on the speed matter, instead, I’ll appreciate the balance and sturdiness provided by this board. Also, I must mention that it’s nearly impossible to make the board bend or flex even when it reaches weight limit (240 LBS). This quality helps keep the board floating smoothly with no restrains. The ISLE Airtech All-Round is a good looking board. It’s made with heavy duty PVC material. It’s perfectly glued to avoid any damages. It comes in a good package. It’s highly responsive and stable in flat water. It packs/unpacks in no time. The package lacks the repair kit. The storage area is a little small compared to other iSUPs.